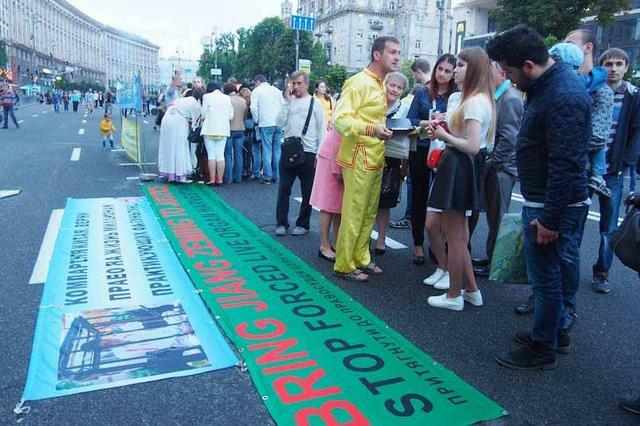 Ukrainian practitioners held a series of activities in the capital city of Kiev on May 27 and 29, 2016. In addition to a Falun Dafa Experience Sharing Conference on May 29, they also gathered at the Chinese Embassy and Kiev City Council to let people know about the practice and raise awareness of the ongoing suppression in China. 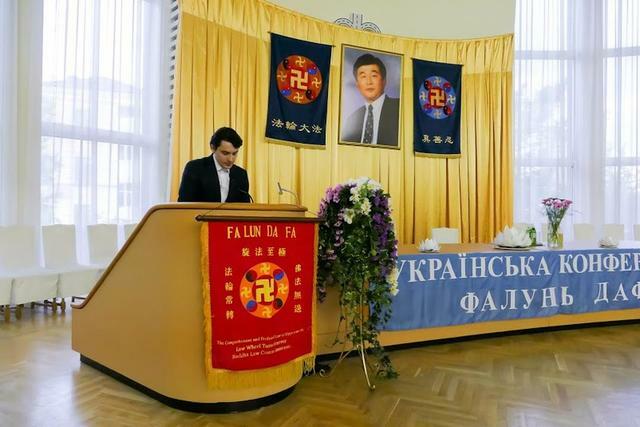 Alexander has practised Falun Dafa for many years. Having witnessed how others benefited and experienced improvements himself, both physically and spiritually, he reflected on how precious the cultivation practice is. “The persecution in China that started in 1999 really disturbed me, because it misled both the Chinese people and international society,” he said. As a result, he spent much time printing materials and telling people about Falun Dafa. To save time and reach more Chinese people, he sometimes stayed overtime at the airport without returning home. One thing in particular that touched him was the moment after Master gave the lecture. Proficient in both Russian and English, Alexander was a translator just off the stage. 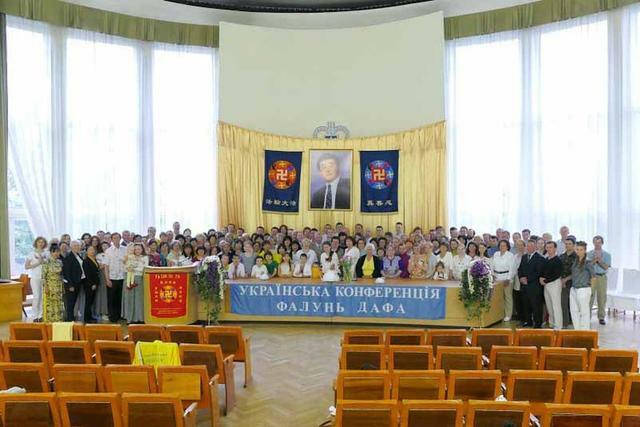 “After Master walked off the stage, he paused, looked at us translators, and waved to us.” Realizing that there were nearly 10,000 practitioners at the conference and that Master greeted the small translation team, Alexander said he could feel Master’s compassion. “Another special thing that happened to me in New York was at a subway station.” At the time, he and other practitioners were walking out of the train station. At the exit, he saw an older black man next to him, who looked at him and said, “I saw you in a dream last night.” The older man's eyes were wet. Her father gave her a copy of Teaching the Fa at the Conference in Europe, which gave her a better understanding of Jesus, the cross, extraterrestrials, and even the moon. “I was overwhelmed by what I found, so I read the book three times straight.” After that, she experienced the purification of her physical body. She also saw the process of karma being released and other supernatural scenes. But the war changed everything: “The sound of tanks and bombings could be heard all the time. It terrified me, and life was horrible.” This made her sometimes lose control, vomit, and even become unconscious. “It was Falun Dafa that helped me through the most difficult days,” she said. Now, Ollikka is no longer bothered by fear of the war. 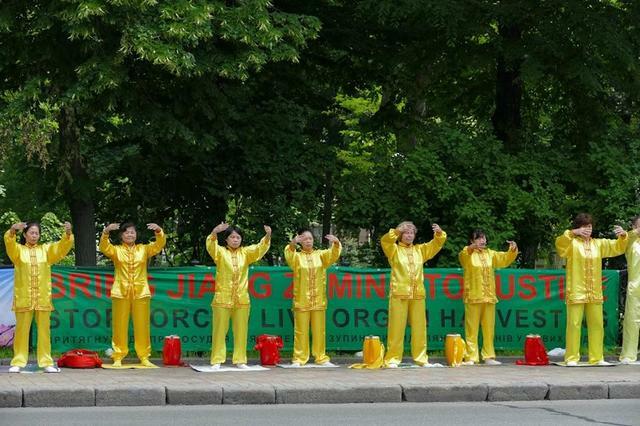 During the days without war, she and other practitioners go out to distribute information about Falun Dafa. “Everyone has been through a long journey before coming here. So I sincerely hope they can benefit from Falun Dafa just like me,” she explained. Tatiana, an assistant to a member of parliament, said that everyone will be responsible for the consequences of their deeds. “I hope my signature will help the innocent people by holding the perpetrators accountable for their crimes,” she added. Noel from Latvia, one of the 13 practitioners who shared their experiences during the conference, said he first heard about Falun Dafa from his mother in 2007. Through the years, he has participated in various activities to raise awareness of the persecution in China. One example was applying for a permit from the city council. He was not sure how to do it at first, but after telling local officials the facts about Falun Dafa, he received the permit. “Then, an officer called me asking if the activity could be postponed by one week, because a Chinese delegation would be visiting the city in a few days,” recalled Noel. With righteous thoughts and compassion, he explained to the officer how Chinese people and officials had been misled by the hate propaganda from the Chinese Communist Party (CCP). Plus, practitioners from other cities would also be coming to the event, and the agenda had been set. Safina started practising Falun Dafa last September. Born in Kazakhstan, she came to Ukraine at age 12. Since childhood, she was a quiet girl, and other children sometimes bullied her. Seeking to improve her health and energy level, she was searching the Internet, and came across Falun Dafa. However, propaganda from the Chinese communist regime intimidated her and she did not move forward. However, every now and then she would continue to hear about Falun Dafa. As she began to work in 2012, she found that many co-workers around her were practitioners. Thinking that this was not coincidental, she began to read Falun Dafa books again. 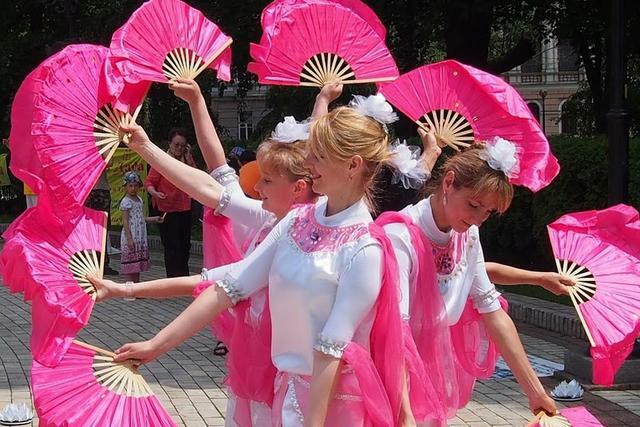 The exercises improved her health, and the principles of Truthfulness-Compassion-Forbearance made her willing be become a better person, starting from family, life, and her daily work. Later, she also wanted to tell others about Falun Dafa and the persecution in China, but found that she had no time to do it. Relating this to her Falun Dafa cultivation practice, Safina realized that she should not waste time, either. “There are still many people in this world who are waiting. And we have to tell them what they need to do,” she said.